Instagram has taken the Internet world by storm, and now businesses have Instagram pages to attract their targeted audience. This popular photo-sharing platform has over 800 registered users online. It helps companies to discover new avenues when it comes to opportunities and growth. Why does Instagram stand out in the market today? You may be wondering as to why Instagram stands out in the market today? It is a social photo sharing platform where you can share visuals and videos with your targeted audience. The market competition is growing drastically, and pictures do have the ability to create strong impressions and statements. Instagram is a mobile application that can be easily downloaded on your smartphone. All you need to do is upload and apply the fantastic photo filters to reach out to your targeted audience. Instagram can also be used by bloggers who wish to increase their reach among the online audience. This theme is very crisp and clear in its design. As the name suggests, its primary motive is to enchant its targeted audience. You will get a host of options for your homepage like different sliders, layouts, subscription boxes and styles to incorporate in your site or blog. 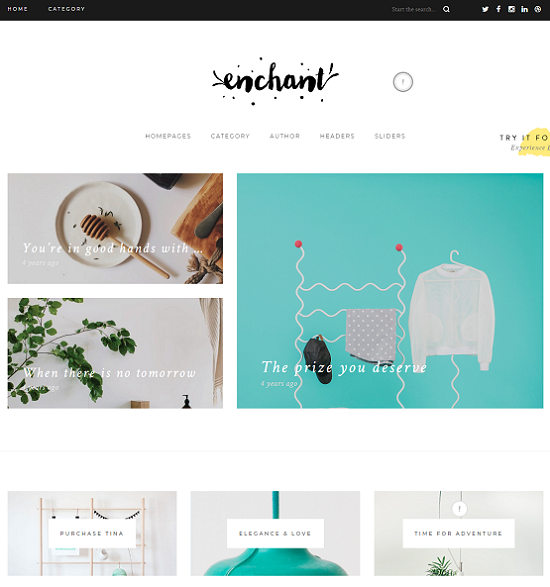 This Instagram WordPress theme is ideal for those that have their blogs. It is perfect for fashion, food, and travel. The design is well-done and streamlined. It also has a list of comprehensive features that are highly responsive for you to use for your website. This Instagram WordPress theme has been created for fashion bloggers. It has a simple user interface and a unique widget that helps visitors shop easily from the items you wish to sell. This theme is ideal for those people who want to highlight their credentials to the maximum levels. 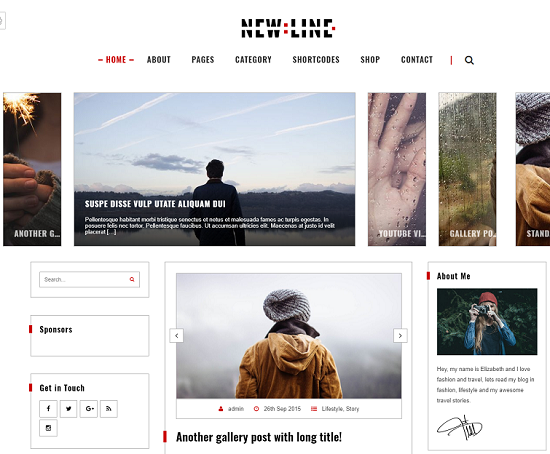 NewLine is a multi-concept theme that you can customize as well. It is handy as you get the options of Drag and Drop Page Builder, WooCommerce Support, WPML, RTL and more. If you are creative, this theme will work correctly for you. It can also be used by bloggers who are looking for a touch of originality in their work. The theme is straightforward and beautiful. There are eight unique post formats, five sidebars and nine different kinds of widgets. This theme gives you lots of room to experiment with. This WordPress Instagram Theme is very stylish and elegant for you to use. It is a search engine optimized theme that gives you a wide range of widgets, social icons, buttons and more. This theme again has been created for bloggers. 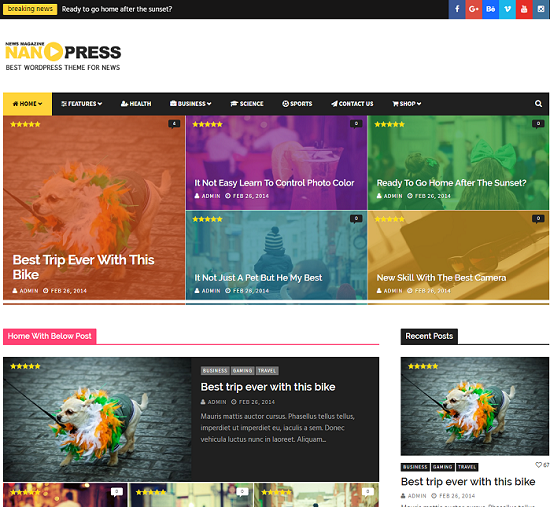 It is a classic and straightforward theme for bloggers that wish to focus on travel, fashion, interior design, art and other fields that are creative and unique. 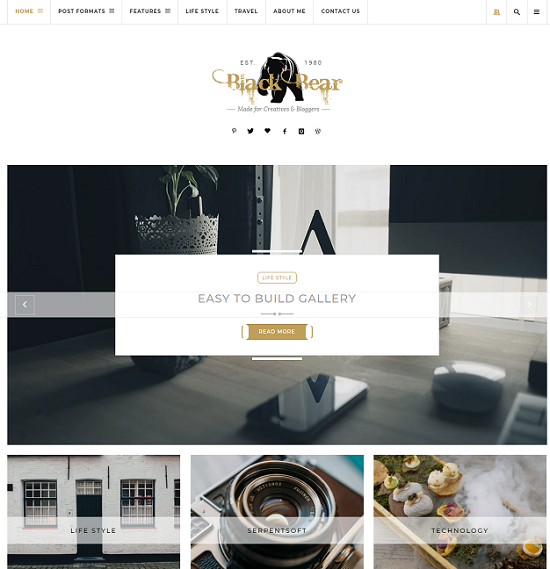 This theme presents you with many features and clean lines for you to use for your blog. If you are a blogger looking for a simple theme that is neat and minimal, Venezia is the best platform for you. It sports a lot of extensive features that help you increase your number of Instagram followers GramBlast that increase shares, likes, and comments. 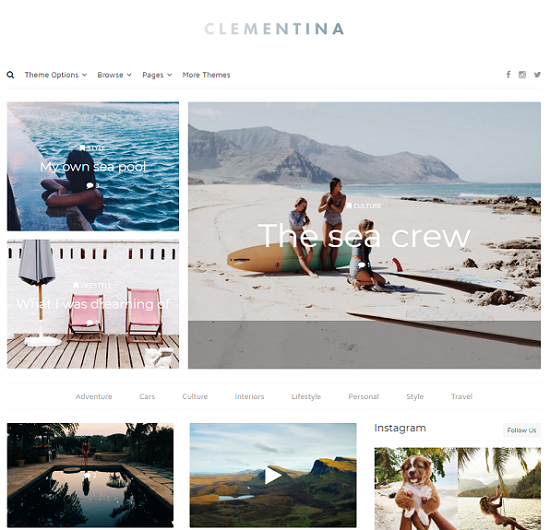 If you are searching for a modern WordPress Instagram theme, this one will suit you well. It is perfect for professional bloggers and creative people. It has four different layouts for blogs, and you can customize it fully with Retina and Responsive Display if you want to. This theme also provides you with the added features of promo boxes and a large feature slider. Rupsha is a clean, pleasing and modern Instagram WordPress site that has been created for fashion bloggers. 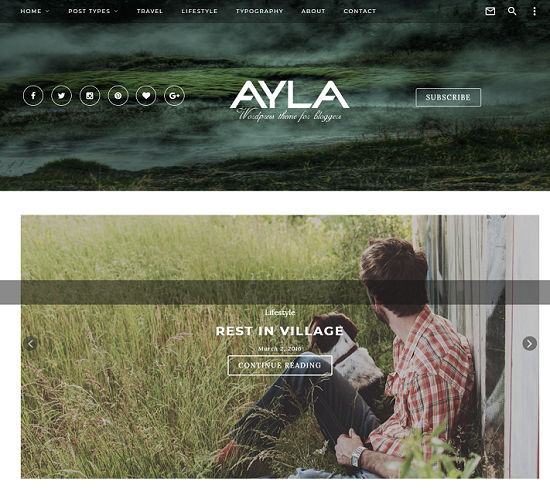 This theme gives you many layouts for your posts so that you effectively can create a useful website. 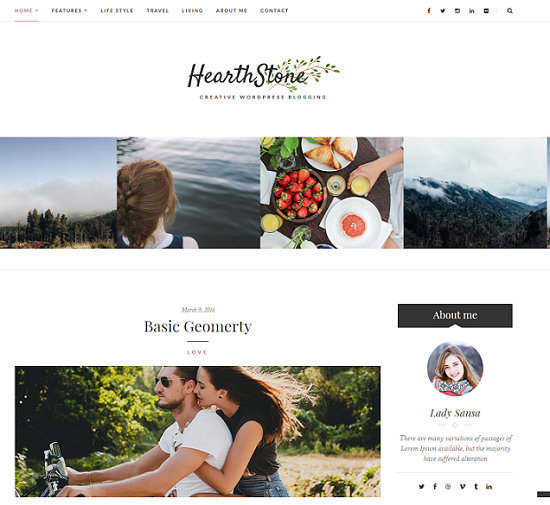 This theme is a premium WordPress Instagram theme that boasts of a neat design and is entirely SEO optimized. This theme is an utterly responsive theme, and you can access it from a wide range of mobile devices. This theme is straightforward for you to use and it boasts of an extensive range of features. 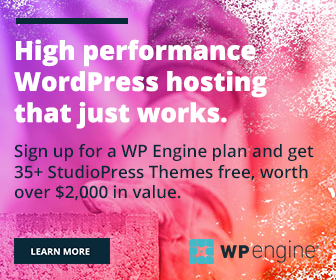 You get the choice of 5 distinct layouts for your blog along with a right sidebar, a left sidebar and a color palette that can be customized fully. This WordPress Instagram theme is a wonderful one grabbing attention. You can get a flexible and clean design for your website. This WordPress Instagram theme gives robust features like a multi-column layout, feature sliders, galleries, extensive ad management, etc. It is a user-friendly platform simple for you to incorporate. 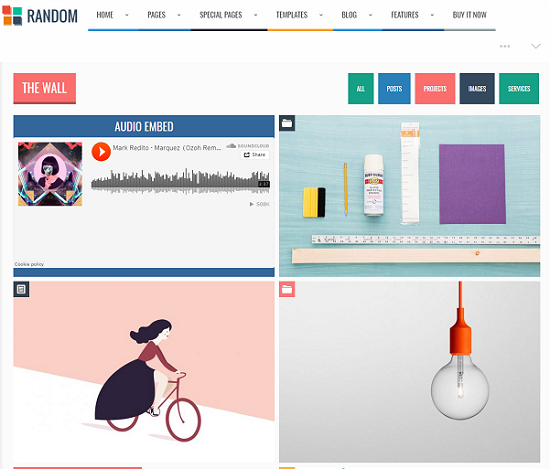 Random is a very modern and contemporary theme for your website or blog. This theme ensures you get several flexible options for your site or blog. This theme has the sole objective to provide a stunning effect to all your images so that they grab the attention of the targeted audience with success. Therefore, with the aid of these beautiful WordPress Instagram themes, you effectively can increase your fan following. These themes are simple for you to install and use. If you are on Instagram and wish to improve your brand presence, make use of these fantastic themes to help you get noticed and grab the competitive edge in the market as well. In case, you are a business owner and still not on Instagram, it is high time you register on it today!